What Is The Best Receiving Duo In The NFL? 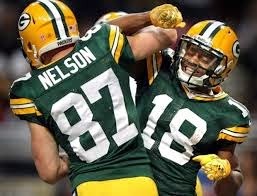 In just 9 games, Nelson and Cobb have a combined 18 touchdowns! Cobb who is second in the NFL with 10 touchdowns, has scored in every game, except week 3 and he also has two games with 2 scores. Nelson also has two 2-touchdown games and has scored in 6 of the Packers 9 games. With Eddie Lacy handling the carries, Cobb is strictly a wide receiver in Green Bay's offense but is averaging a little less than 5 receptions a game for 72 yards. Nelson on the other hand, is 5th in the NFL with 889 yards and tied for 7th with 56 receptions. Demaryius Thomas has built a great chemistry with Peyton Manning over the past few years and it seems like Emmanuel Sanders has been with Denver for years as well, but it's only been 10 weeks. Thomas is third in the league with 65 receptions and Sanders is right behind him at #4 with 62. Thomas is second in yards behind Antonio Brown and is just the 2nd player this year to reach 1,000 yards receiving. Both Thomas and Sanders have 6 touchdowns, and have been great weapons for Peyton Manning. This offense is so good, I was forced to leave out Julius Thomas and his 12 touchdown receptions! Well Antonio Brown is having the best season of any receiver in the NFL this year and the numbers don't lie. Brown ranks #1 in receptions AND yards with 79 receptions for 1,070 yards and 8 touchdowns. Brown has gone over 100 yards 5 times, 90 yards 3 times, and at least 74 yards twice. He has three 2-touchdown games as well. His partner in crime, is a rookie who many people still have never heard of. His name is Martavis Bryant and he has only played in 4 games. Bryant immediately made an impact as he has scored in all 4 games and has 6 touchdowns on the season. Bryant is a big play waiting to happen. On 14 catches, Bryant is averaging 22 yards. Also 14 catches and 6 touchdowns = 43% of his catches have gone for touchdowns. The Dallas Cowboys have leaned heavily on DeMarco Murray in the run game this season. Murray has 411 yards than Arian Foster, on 71 more carries than LeSean McCoy. Yet Dez Bryant has been the receiver fantasy owners hoped for when they drafted him near the end of the first round, early in the second round. Terrance Williams has been TD reliant and tough to own in PPR leagues with just 27 receptions for 246 yards. The Browns Taylor Gabriel has more receiving yards than Williams! Tony Romo has targeted Williams 10x just once in his young NFL career, October 27, 2013 against the Detroit Lions. He caught just 2 of the 10 targets. After suffering a serious knee injury last preseason, forcing him to miss the entire 2013 season, Jeremy Maclin looks better than ever so far this season. Maclin is 8th in the NFL with 828 yards and is tied for 4th with 8 touchdowns. After losing DeSean Jackson, the Eagles air attack was supposed to take a hit. Rookie Jordan Matthews has stepped into Chip Kelly's offense and has played a huge role. Matthews has 451 yards and scored 5 touchdowns. Mark Sanchez seems to have a ton of faith in him moving forward, as the two connected 7 times for 138 yards and 2 touchdowns on Monday Night Football. When talking about the best receiving duo's in the NFL you would think it's rare to find any rookies or tight ends on this list, let alone on the same team. For the Panthers the rookie Kelvin Benjamin and their tight end Greg Olsen have been great weapons for Cam Newton. Benjamin is 14th in the NFL with 659 yards and Olsen is 15th just 1 yard behind his teammate. In 10 games, Benjamin has 7 touchdowns, which is tied for 9th in the league. Olsen has 5 touchdowns, has gone for 100 yards or more in 2 games this year and has at least 60 yards in 7 games. When Rob Gronkowski is healthy, he challenges Jimmy Graham as the best tight end in the game. Luckily for Tom Brday, Gronk is back! Over the Patriots first 4 games, Gronk was held to 44 yards or less but did score 3 touchdowns in that span. Since then, in 5 games, Gronk has scored 5 touchdowns and has put up 100, 94, 68, 149 and 105 yards. His teammate Julian Edelman is picking up where Wes Welker left off 2 seasons ago. Edelman is 12th in the NFL in receptions with 54 for 556 yards and 2 scores. Well here's another tight end and rookie WR combo! Jimmy Graham is clearly the main target for Drew Brees, as the two of them have hooked up 56 times for 594 yards and 7 scores. Graham ranks 7th in the NFL in receptions and 9th in touchdowns. Rookie Brandin Cooks made his impact felt in week 1 as caught 7 balls for 77 balls and a touchdown in his debut. For the year, Cooks has caught 48 balls for 500 yards and 3 touchdowns. Julio Jones ranks 6th in the league with 853 yards (95 yards/game) on 61 receptions. However he only has found the endzone three times and two of those came back in week 3 against the Bucs on Thursday Night Football. Since then, Jones has gone scoreless in the Falcons last 6 games. White has hit the century mark just once this season in his 8 games played but does have 4 touchdowns. At the age of 33, he's still a very valuable weapon playing along side Julio Jones. At 6'4 and 6'3 the Bears receiving duo has great size, however Marshall and Jeffery are underachieving in 2014. Marshall got off to a hot start as he found the endzone 4 times in Chicago's first two games (thanks to a 3-touchdown game against the 49ers). However in 6 of the Bears 9 games, Marshall has been held under 50 yards receiving. A lot of that has is due to the fact he's been dealing with an ankle injury all season. Jeffery has just 3 touchdowns so far this season, to go along with his 44 catches and 626 yards. In reality though, tight end Martellus Bennett has had the best year for Bears receivers with 49 catches, 562 yards and 5 touchdown. When healthy, we all know Calvin Johnson is the best receiver in the game. Look at week 1 against the Giants. Megatron was nearly unstoppable, as he went off for 164 yards and 2 touchdowns. Unfortunately Johnson has a problem staying healthy. Johnson has missed 3 games and has been very limited for 2. This past week Johnson looked like he was back as caught 7 passes for 113 yards and a touchdown against Miami. Golden Tate has been a huge pickup for the Lions. Tate has the second most receptions in the NFL with 66 and is 4th in the NFL with 909 yards. Despite all the catches and yards, Tate has only found paydirt 3 times. With Hilton and Wayne, Luck can air it out for the big play, or complete a shorter pass to convert a first down. Hilton got off to a slow start over the first two weeks of the season, but over the Colts last 7 games, Hilton has gone for over 100 yards 4 times, including a game with 223 yards and 155 yards. Although he has just 3 touchdowns, he ranks third in the NFL in yards. Reggie Wayne is no longer the guy who is going to rack up the yards but he is Mr. Reliable. When the Colts need a first down, Wayne is Andrew Luck's go to guy. Wayne has 42 catches for 504 yards and 2 touchdowns on the year. You could substitute Dwayne Allen and his 7 TDs for Wayne, but he has caught just 19 passes that have not resulted in a score. Keenan Allen is the Chargers number 1 pass option with 47 receptions for 474 yards but has found the endzone just 1 time all season. That's thanks to Antonio Gates, who I think forgets he is 34 years old. Gates has just 35 catches but has 9 touchdowns! That's a touchdown every 4 catches. It might not look like Allen is having a good season because he has just 1 touchdown, but he helps the Chargers move the ball down the field and Gates finishes off the drive when the team gets inside the red zone. Malcom Floyd actually leads the team in receiving yards, even though he has less targets than Allen does receptions! Eddie Royal leads all WRs in scores. I was praying for a miracle season from Pierre Garcon and DeSean Jackson! Click here to read my post from before the NFL season started.